This was something of an experiment and another chance to pop open a bottle of wine. While walking the Trader Joe’s isles, I noticed a section of spaghetti sauces. 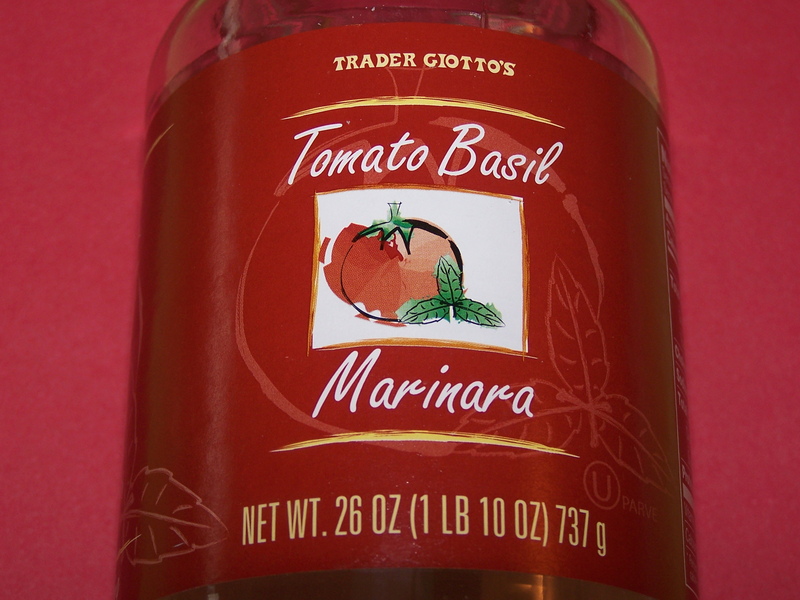 Since the price was only a little more than the cost of ingredients for my home-made marinara sauce, I decided to put Trader Joe’s to the test. In a nutshell, it worked pretty well, but is probably better used for a quick pasta sauce than for using in lasagna. Upon opening the jar, the finger test proved rewarding. As an aside, unless you have some fond memories of where your finger has recently been, try some hand hygiene first, or use a spoon. The sauce had a nice taste to it. Almost as tasty as the home-made sauce. The consistency was a bit more watery than the home-made variety. That had me a little worried about the final outcome of the lasagna, since the home-made variety is definitely thicker. My other concern was the taste. While the taste is good, it is not the overpowering taste the home-made sauce has. For lasagna, overpowering sauce is not a bad thing, because the flavors are going to have to cover all the pasta and cheeses that go into the lasagna. I resisted the temptation to doctor the sauce. What’s the purpose of buying a pre-made sauce if you’ll spend as much time in preparation as making it from scratch? Also, less work means more time to concentrate on the wine. Although (one of the bad things about cooking with wine, the notes get a little sparse), I may have added some oregano, as that was missing from the jar. As for the actual lasagna, follow the recipe here, just substitute Trader Joe’s for the home-made sauce. I heated Trader Joe’s first in a sauce pan, just because that’s how the home-made sauce goes in the lasagna, hot. Since there’s a little more of Trader Joe’s sauce that the home-made recipe, be generous when putting the sauce between the layers. After all, what are you going to do if the jar isn’t empty after you’re finished? The final results were pretty good. My suspicions were slightly correct about the final taste and the consistency of the lasagna. The consistency was a little looser than the home-made sauce. However, it was still firm enough to make good layers, The final taste was a little blander than using the home-made sauce. Overall, it was still pretty acceptable and better than heating up a commercial frozen lasagna. However, it hasn’t convinced me to switch away from making and using my home-made sauce, which straight from the pot is still one of the best oral pleasures one can find without risking the growth of microorganisms where they shouldn’t grow. If you know what I mean? This entry was posted on 05/29/2010 at 11:38 and is filed under Recipes, Recipes, food, cooking and related items, Trader Joe's. You can follow any responses to this entry through the RSS 2.0 feed. You can leave a response, or trackback from your own site.